Follow Friday (also known as #FF and #FollowFriday) is a way to recommend people in Twitter. The premise is simple: someone is contributing to your PLN or tweeting about things that you have enjoyed, you recommend them on a Friday. Any Friday. Every Friday. It’s your choice. In your recommendation, you include the hashtag #ff, #FF or #followfriday. There is also #SLPeepsSaturday which is along the same lines to recommend SLPeeps on Saturdays but I’m focussing on Follow Fridays today for a specific and good reason (see the end of this post). #FF @CASLPA because they are the best professional association on Twitter and take care of their members (and non-members). A huge #FF to @TwitterHandle for helping me out this week and making my life easier when I had to do a fluency assessment. 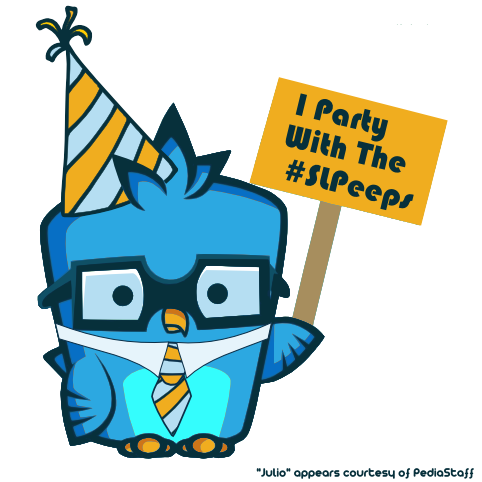 #FF @OtherTwitterHandle because his/her tweets are helpful to the #SLPeeps – especially for literacy info! Only recommend people you truly feel are worthy of being followed by others in your PLN. People so new to Twitter that they haven’t yet tweeted anything or may not stick it through in the long haul (although giving a shout out or otherwise letting people know they’ve joined is still a good idea, just not in a “Follow Friday” way). People who are not tweeting actively anymore (e.g. for more than a month or two). You can choose to mention several people in an #FF tweet but it’s always better to provide one tweet per person you are recommending. It’s more personal, gives your followers the reason why you think they should follow someone and may actually cause people to follow them (which is kind of the whole point, right?). Most importantly, it’s paying that person a more specific compliment and building up others in your network. @dayneshuda on Twitip.com said this and more very eloquently here. Ever since I read that last fall I have more often than not created specific and detailed FF recommendations, rather than ramming in as many people as possible into each tweet. 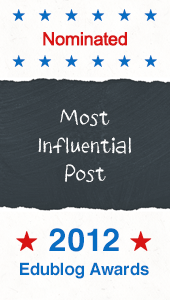 People really do appreciate it and I get a chance to publicly recognize others in my PLN in a much more heartfelt way. There is a ranking system for FF recommendations. It’s managed through FollowFriday.com and ranks people based on the number of FF recommendations they receive each Friday (no matter where in the world it is Friday) . This is ranked globally but also by country. I don’t think anyone should be overly concerned about their FF rankings in general, but it is interesting to look at who is getting the most FF recommendations to consider who you may choose to follow. FollowFriday.com assigns points to each user for getting FF recommendations from other users. It works like this: you get 50 points if you are the only one recommended in a tweet – if you are given a recommendation with others in the tweet, the points are divided by the number of people in that same tweet. So if you are recommended in a tweet with 5 other people, you only get 8 points for that recommendation. The rules to get points are that you must be mentioned in an ORIGINAL #FF tweet (so RTs do NOT count, nor do replies or thank yous to the original #FF). Another important rule is that your FFs won’t be counted if you recommend more than 50 people in a given week – probably because they think you are spam and who honestly has time to recommend 50 or more people?? The final important rule is that only your FIRST recommendation for a given person will be counted per week. IMPORTANT: If your tweets are protected, they will NOT be counted for FF rankings! I think those are the most important rules, but the other rules can be found here. The CASLPA conference is running from April 27-30, 2011 in Montreal, Quebec. I know that you all rave about @CASLPA (pronounced castle-pah) and love what they do for you and how they interact with you on Twitter, even those of you who aren’t members. I’d like to propose a challenge – let’s make @CASLPA one of the top 10 #FF recommendations in Canada this coming Friday leading up to the conference. They didn’t know I was going to do this until now, so this is completely unsolicited on @CASLPA’s part! How can you make @CASLPA top 10 in Canada on Friday, April 22, 2011? I actually don’t think it will be difficult to accomplish this task. We simply need people to recommend @CASLPA in a heartfelt #FF tweet this Friday. Obviously feel free to recommend others in other tweets, but please be sure that your recommendation to @CASLPA only includes them so they can get the maximum points possible from your recommendation. Since each FF gets 50 points (assuming you don’t FF anyone else in the tweet) 20 people would give @CASLPA 1000 points! That’s typically been enough points to be in the top 10 (for Canada – US ranking is an entirely different story). Also, if you want your #FF shout out to count in the rankings, you must set your account to be unprotected when you tweet the #FF or it will not get counted. But this Friday is “Good Friday”? That’s OK, if you’re busy all day Friday with family or church commitments, you can do your FF recommendation on Thursday night or early Saturday morning if you live in North America or Europe. If you live in Australia, you have all Saturday morning for your FF to be counted. So this Friday, if you like following @CASLPA and you think others should follow them too, please consider making a #FollowFriday recommendation on Twitter to say so and give them a real boost going into their national conference! They are so worthy of a #FF! thanks, Dean. I hope they can get in top ten – they ARE worth it!